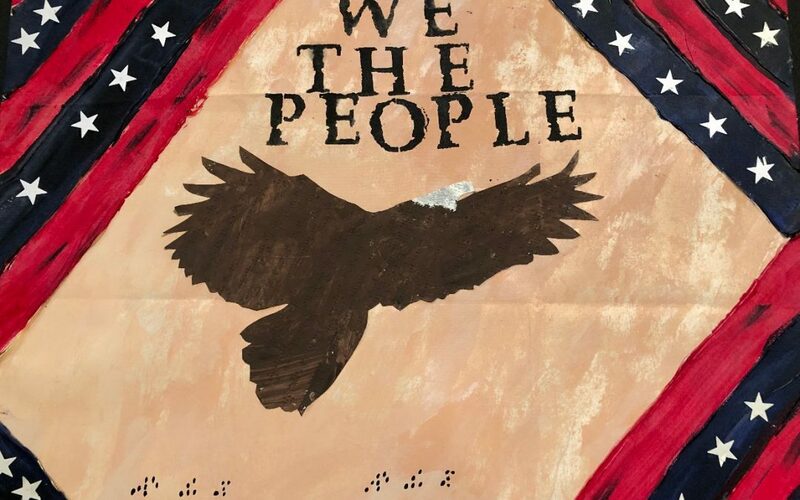 Borderless Arts is honored to be part of the Charles Pinckney National Historic Site art exhibition, “We The People”. Charles Pinckney was a principle author and signer of the United States Constitution. Our job was to create art to represent some of the words in the constitution. Special thanks to Monica Leister who worked with students at the Tennessee School for the Blind. The student who created the Eagle piece used hot glue to make Braille dots to say Unity and Freedom. One student created a giant rose to symbolize that everyone is different, but beautiful in his/her own way. Another participant created a piece of art called Concentric and the young artist said that people are similar to concentric objects people because at the center they share the same needs, wants and problems. Thanks to our Teapot Diplomats Adam, Hope and Lexi who also contributed to the project. This is part of the Teapot Diplomat program which is supported by Mark and Niki Antonini.